Last year, Kate Spade came out with an entire line of flamingo print items for summer, which were absolutely adorable. In fact, I even splurged and purchased a Kate Spade dress with the flamingo print that you can see in a post from last year here. This year, I think J. Crew may have taken the flamingo trend to the next level with this painterly, watercolor print featuring our favorite pink, long-legged bird, the flamingo. The thing I love about J.Crew's take on the flamingo trend is that their print is just impressionistic enough that from far away you can't quite tell what you are looking at. Upon closer inspection, you realize it's actually a flock of pinkish-red flamingos, providing a fun surprise! To play up the fact that the flamingos printed on my blouse are portrayed with an impressionistic twist, I decided to use my Kate Spade artist palette clutch that features swaths of color and a golden paint brush as a clasp. Not only did the clutch match thematically with my outfit, but the colors were perfect too! Nice look! Love the skirt! I love all things having to do with birds, and this top is just too cute!! Love the whole outfit; it has both a chic and fun vibe! I love the print of the blouse! Great outfit with the pencil skirt! And the clutch is fabulous, too! love this look!so stylish and bright! 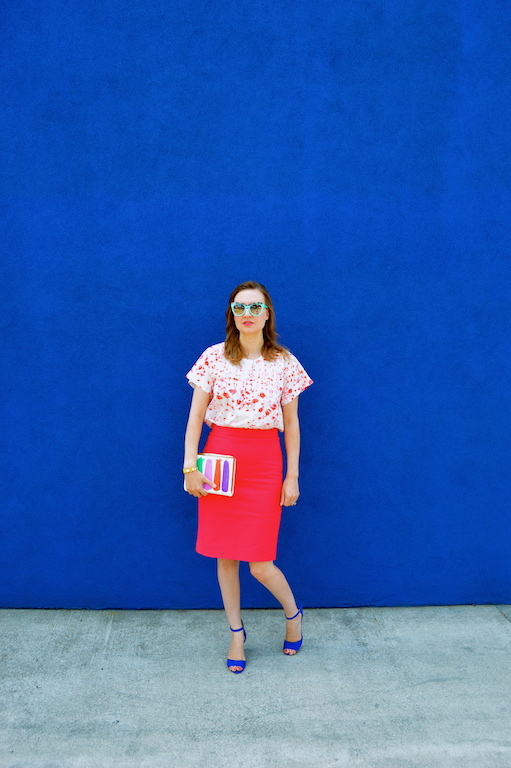 I love these vibrant colors and the loose blouse against the fitted pencil skirt. Beautiful summer look! Oh Katie, you've done it again. Love the coral hues from your top and skirt. Plus, the pops of color from your sunnies and heels add more fun to the outfit! That is a cute top and your blue skirt looks good! Your clutch and sandals are cute too. such a cute look! absolutely love the clutch! This look is so fun! I love that clutch! And that flamingo top could not be cuter! I love the cut of that shirt and of course, the impressionistic flamingos are adorable! The clutch is perfect. And the blue shoes are pleasant surprise! Adorable outfit! Wow, that is such a neat blouse! You are right, i had no idea it was flamingos until you pointed it out, up close ! Of course I love all of the color you are known for Katie the red and that fun clutch! I love J.Crew's watercolor take on the pink flamingos. That top is beautiful and is perfect with the red classic skirt. The impressionist clutch goes so well with the top, too.